Although the majority of oak used for construction is green (wet), it is occasionally necessary to use a dry beam, for example for floor joists, where it is critical that shrinkage and movement of the beams is minimised. 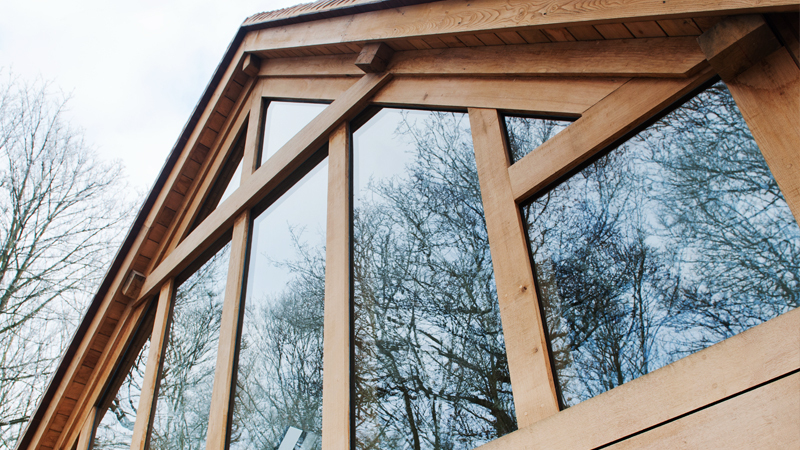 However, although it is tempting to specify dry oak for whole structures because it seems easier and less risky, it is likely that the beams will not be available and dry oak is considerably more expensive. Defining the qualities of a dry oak beam is problematic because to some suppliers dry means a couple of weeks outside whereas to an architect it means less than 15% moisture. Vastern Timber has a simple policy for dealing with this problem – if dry oak sections are available to cover your requirement, we will give you an indication of how old and dry they are and if they are not available, we will offer an alternative. Kiln dried oak beams (moisture approx 15%). Available in thicknesses of up to 100mm. Air dried oak beams (moisture approx 25%). Available in thicknesses of up to 150mm. Semi seasoned / weathered structural grade oak beams (moisture approx 20% – 60%). Subject to availability. Fresh cut structural oak beams cut from old felled logs which have been ‘settling’ for over three years (moisture – wet). Cut to order. Sections available Max 100mm thick for KD. Max 150mm for AD. Various for semi-seasoned. Up to 6.0mt x 400 x 400mm for old-felled. Weight Approximately 850KG / M3 when air dried and 700KG / M3 when kiln dried. Semi seasoned Dependent on age. Old felled Less than 0.5% along the length. Between 5% and 7% across the section. Working properties The drier oak gets, the harder and more difficult to work it becomes. Dry oak will blunt tools quickly. Chemical properties Oak contains tannic acid which will corrode ferrous metals. When the two come into contact, a blue sludge is formed which will stain the oak and anything else it comes into contact with. All fixings used in conjunction with oak should be stainless steel. This is less of a problem with kiln dried wood. Insect attack The ambrosia beetle can attack the wet timber (30%+). However, the beetle will die as soon as the wood dries to less than 30%. Re- infestation will not occur. Other dry wood will not be affected. Sapwood is commonly attacked by the powder post beetle (Lyctus spp). However, sap is normally excluded from oak beams. Fire Surface spread of flame class 3 (BS 476-7).